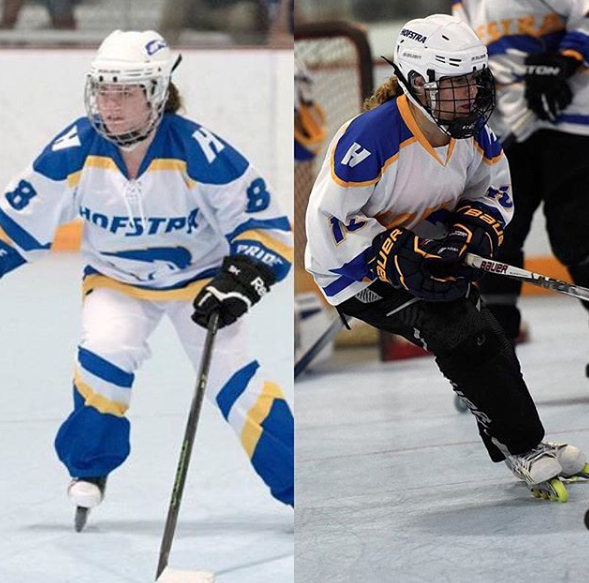 Club Roller Hockey traveled to Feasterville, Pennsylvania on Saturday, March 3rd and Sunday, March 4th to compete in the ECRHA Regional Championships. The Division 4 team went 2-1 in pool play by beating Stony Brook 5-1, Cornell 6-2, and falling to St. Josephs (NY) 3-2. The team then beat Baruch 3-2 in an elimination game to advance to the semifinals against Millersville. Millersville, the eventual regional champions, would beat Hofstra in their semifinal game 5-1. Pete Myers and Ryan McCallen led the team in points for the playoffs with five each. McCallen also led the team in goals with 4, while Kayla Kyff led the team in assists with 4. The Division 4 Goalie of the Year, Sam Reynolds, posted a 2.60 GAA and a .867 save percentage in the playoffs. Club Men's Ultimate Frisbee traveled to a tournament in Atlantic City, New Jersey on Saturday, March 3rd and Sunday, March 4th. The team managed a win over Westchester University, but suffered losses to the Massachusetts Institute of Technology, St. Joseph's College, Brown University, Navy, and Rowan University. Club Women's Ultimate Frisbee also competed in Atlantic City, New Jersey on Saturday, March 3rd and Sunday, March 4th. The Pride competed in seven games over the two days. On Day One, Hofstra beat Colby College 6-4 and Wesleyan University 7-5, but fell to Salisbury University 7-5. On Day Two, the Pride won games against Stockton University and Shippensburg University and fell to SUNY Fredonia and Shippensburg University in a rematch of a contest from earlier in the day. The team took fifth place overall in the tournament. Club Men's Rugby took on William Paterson University in Wayne, New Jersey in their first game of the season on Saturday, March 3rd. Although the Pride started out strong, William Paterson was quickly able to score three tries and take a commanding 19-0 lead in the first 40 minutes. Hofstra's Jeremy Tabansi would score the lone try for the Pride on the day, but the Pride would wind up falling to the Pioneers by a score of 60-7. Club Billiards competed at Raxx Pool Hall in West Hempstead, New York on Sunday, March 4th. All five competitors won their matches for the Pride and the team won their weekly match 11-2. Club Rock Climbing traveled to Brooklyn Boulders in Brooklyn, New York for their weekly climb on Saturday, February 24th. Those that attended enjoyed the outing and worked on some challenging climbs. Club Men's Lacrosse hosted Stony Brook University and New York University at Shuart Stadium in Hempstead, New York on Sunday, March 4th. The Pride beat Stony Brook 11-1 and NYU 6-2. 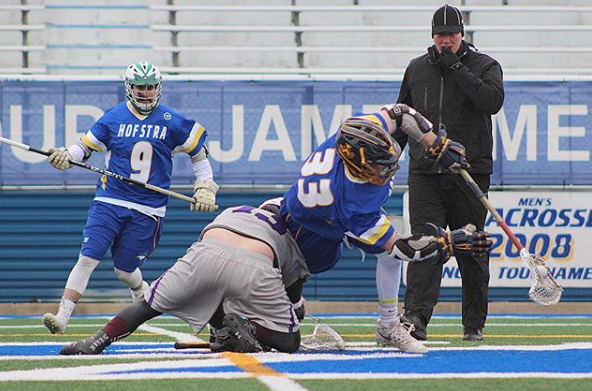 Club Men's Lacrosse faced off against Stony Brook University and New York University on Sunday, March 4th at Shuart Stadium on the campus of Hofstra University in Hempstead, NY. PC: Zachary Englis. Ryan led the Pride with 13 goals, 9 assists, and 22 points for the 2017-2018 season. 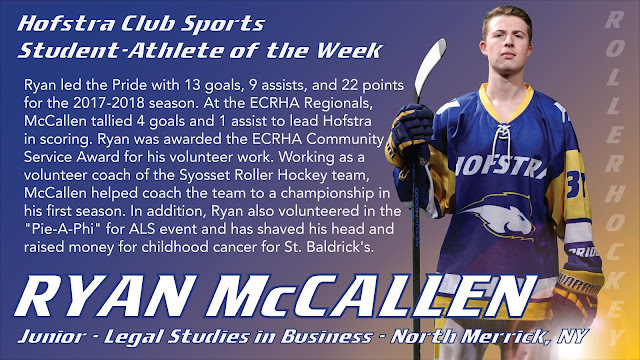 At the ECRHA Regionals, McCallen tallied 4 goals and 1 assist to lead Hofstra in scoring. Ryan was awarded the ECRHA Community Service Award for his volunteer work. Working as a volunteer coach of the Syosset Roller Hockey team, McCallen helped coach the team to a championship in his first season. In addition, Ryan also volunteered in the "Pie-A-Phi" for ALS event and has shaved his head and raised money for childhood cancer for St. Baldrick's.